dropcaps]W[/dropcaps]hen you are using a vehicle, it is prone to get it damaged with regular wear and tear. However, there are latest products available which will protect the paint of your vehicle from scrapes, nicks and rub offs. We at Alfa TInt & Detail believe that Clear Bra is the ideal shield for the paint from such damages. You can make your car look brand new for years by using this unique quality product. When you buy a new vehicle you go for the particular color and you definitely don’t want to use any products which will make the paint appear dull or without the glossy look. When you use clear bra protection film you don’t have to worry about losing the look of your car as this remains invisible and provides high gloss to the vehicle. You can use this film for completely covering the vehicle or you can just cover the most vulnerable area of the body. The important factors that affect the car’s finish are road debris, chemicals, inclement weather, and acidic substances. The Automotive Paint Guard Film acts as a barrier between your automobile paint and items like rocks and pebbles on the road or the winter salt, which can cause damage to the paint. You don’t have to worry about the acidic bird droppings or the scratches or staining by chemicals when you have clear bra protection for your vehicle. Premium protection designed to last. SunTek PPF Ultra is scientifically formulated to maintain the beauty and integrity of vehicle finishes for many years, in all kinds of weather. It’s a combination of innovative film technologies that we stand behind with a 10-year limited warranty. 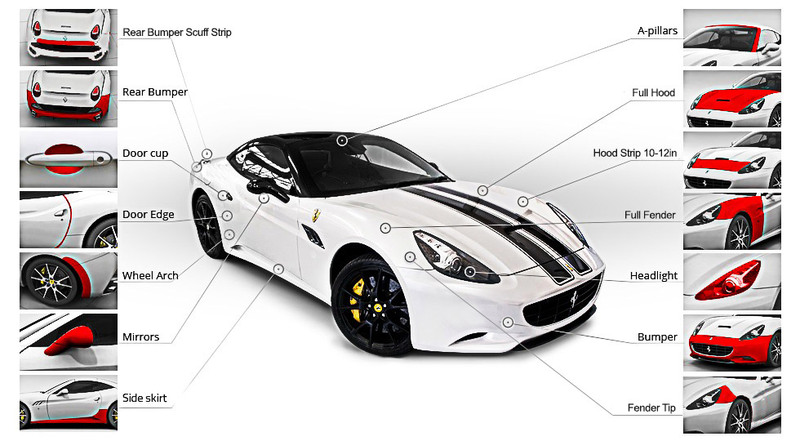 PPF Ultra comes in either optically clear high-gloss or matte finishes, so it disappears into automotive paint and can be used to create specialty effects. With either finish, there are benefits of self-healing film and our proprietary HydroResist technology. Paint Protection Film (PPF) is made of thermoplastic urethane film and is available in different thickness and colors. It is necessary to install the protective film with the help of professionals who are well trained for the job. We have well experienced and trained staff to do the installation of clear bra film. The self-healing clear film is resistant to staining, cracks and yellowing. Once you have the film installed, the caring and maintenance of the car gets easy. You will be able to keep your vehicle’s exterior in perfect condition with the help of this pain protection product. You can find film applications suitable for bumper, hood, fenders, rear view mirrors, rocker panels, handles, door edges and steps. When you install the film at Alfa TInt & Detail , your PPF will be covered by a limited lifetime warranty. Repainting your vehicle can weaken the resale value. There is no doubt that you will be making a huge investment when you buy a new vehicle. From the moment you drive your vehicle from the showroom, the sparkling paint job on your vehicle is at risk. Stones, sand, winter salt and debris from the road will cause damage to the vehicle’s exterior paint, especially the bumpers, hood and rear view mirrors. The new vehicle will start to show wear and tear after a month or so. Your vehicle does not have to meet this fate. Invest in the Paint Protection Film and this will help in protecting your vehicle’s exterior paint finish. Using a Nano-fusion PPF will ensure that your vehicle will have a higher resale value in the market when you plan to sell it off in the future. The Nano-fusion is almost invisible and this will help in bringing out the shine of your vehicle’s exterior paint color. Despite the Nano-fusion PPF looking invisible it has got great strength to protect the vehicle’s exterior paint from sand, dirt, road debris and winter salt. If your vehicle is installed with the PPF from a certified and reputed professional like Alfa TInt & Detail, then you need not worry about any paint peeling, cracking or bubbling. The Nano-fusion PPF comes with a limited lifetime warranty and this is the only PPF in the market to be offered with a lifetime warranty of now.